Kangana Ranaut’s Tanu Weds Manu Returns Promotional Style Rocks! Busy with Tanu Weds Manu Returns film promotions, Kangana Ranaut and R. Madhavan have been seen out and about Mumbai. She looks effortless in a hot pink Payal Khandwala sari paired with Jaipur gems. 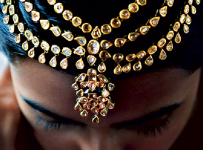 With a gajra in her hair and a bindi on her forehead, she rocks this desi avatar. 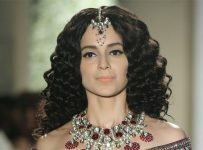 Right off the runway, these Quirkbox separates look amazing on Kangana. I liked how she chose not to wear any accessories. Visiting the set of Masterchef, she surely made heads turn in a Hemant & Nandita dress! She’s probably one of the very few who could pull off this Dutch look. Kangana shows us that it’s cool to wear sneakers with dresses! She looks wonderful in this striped Stella McCartney jersey dress. Are you liking Kangana’s style statements on this promotional run so far?